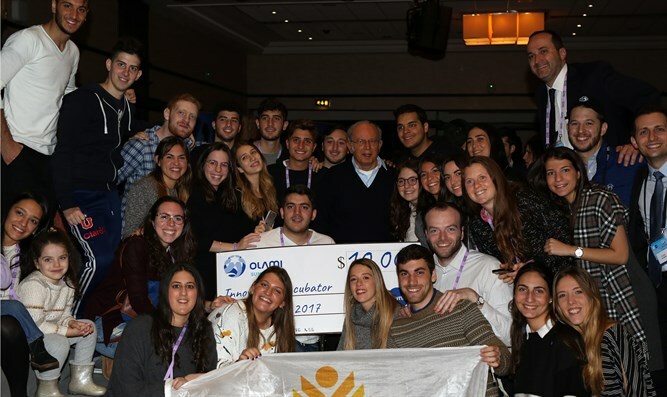 184 delegates from Nefesh Yehudi in Israel join 1,300 young delegates from all over the world at the Olami Global Summit 2017. The Israel-based Nefesh Yehudi organization sent 184 delegates to the Olami Summit 2017. Olami, the global community of Jewish organizations committed to inspiring young Jews about their Judaism, hosted last weekend its 2017 Global Summit in Europe, the largest global gathering for young Jews. During the Summit, Olami announced a brand-new global initiative to honor Israel’s fallen, 70 years after the creation of the State of Israel, as well as new Regional Ambassadors who will represent Olami across the globe. The 12 winners of this international leadership award hail from Israel, Russia, France, UK, Argentina, South Africa, and the USA. They will receive leadership training and travel the world to communicate how they think Judaism inspires Jewish greatness. Continuing from the success of last year's Innovation Incubator funding programs, Olami this year offered 6 new projects funding to pilot their ideas. The 1,300 delegates from 320 organizations across the globe were joined by speakers including Education Minister Naftali Bennett, Rabbi Lord Jonathan Sacks, Rabbi Dr. Akiva Tatz, former Chief Rabbi Yisrael Meir Lau, and many other Jewish community leaders, philanthropists, and educators. The theme for this year’s Summit was "Own It," which aims to inspire a global community of young Jews to take ownership of their lives and their Judaism and to give them leadership and innovation opportunities for inspiring their Jewish communities back home. In keeping with the theme and focus on leadership, the Summit offered several leadership opportunities the first of which is the Innovation Incubator, which is funded by the Olami Foundation. The fund is designed to help finance grass roots initiatives aimed at stimulating Jewish growth, learning, and awareness around the world. To date, the program has financed 60 projects with an investment of between $10k-$50k per project. This year's delegates were invited to present their ideas for Jewish innovation to the key funders at the Summit and to Olami, pitching for $10,000 from the Innovation Incubator fund to pilot a creative Jewish initiative. Over 40 projects were pitched throughout the weekend. Six of these projects received funding to pilot their ideas, including Menora from Argentina, whose Kosher Food Truck will provide access to low-cost kosher food to universities and other places where there are a large number of young Jews. The Israeli Nefesh Yehudi’s Ushpizin project proposed a hospitality app, which will enable Jews visiting Israel from across the world to stay at Jewish households, maintaining the sense of community and belonging for Jews no matter where they are from. The Summit's climax was the unveiling of Yizkereim, a global initiative to honor the 23,545 fallen soldiers who heroically fought to protect the State of Israel since its creation. Delegates will be encouraged to learn Torah, perform acts of kindness, and to engage meaningfully with their Judaism in the merit of their assigned fallen heroes. Olami is now encouraging people from all over the world to sign up to the Yizkereim project and do something positive in the name of all the fallen heroes before Yom Hazikaron 2018. 700 delegates, representing 20 different countries across North America, Latin American, the Former Soviet Union, and Israel, began their journey in Central and Southern Spain, where they explored the rich history and heritage of the Jewish people. They continued their journey to London, meeting another 600 European delegates who took part in the Opening Ceremony. Following the ceremony, which included an address by Rabbi Lord Jonathan Sacks, the 1300 delegates traveled to Birmingham to enjoy an inspiring, educational, and empowering weekend. Olami CEO Rabbi Menachem Deutsch said, "This year’s Olami Summit was our biggest Summit yet, with 1,300 high-caliber delegates from all corners of the globe attending. The excitement was palpable as students made lasting connections with their international contemporaries and heard inspiring lectures from global Jewish leaders, thinkers, and educators." "It is a great honor to be able to announce the Yizkereim project to honor Israel’s fallen, and we anticipate that not only will people across the world learn a great deal about those who have fought to defend and protect the state of Israel, but it will also encourage a positive change from all those who take part, whether it’s through their increased learning, the extra act of kindness or just thinking slightly differently about the world around them. "Olami aims to inspire change and positive Jewish experiences, which I believe has all been exemplified in this year’s Olami Summit. Olami is excited to see what the next year will bring and follow the journey of the incredible educational programs that our talented delegates will produce."